Multi-polar astigmatic correction manages unwanted cylinder in all meridians, creating a balanced progressive design that increases wearer comfort. It takes into account the three-dimensional orientation of the eye and its axis of rotation and provides proper eye to lens alignment in all directions. This significantly improves panoramic vision and image stability. Advanced aspheric compensation optimizes the optical performance of the lens in the as-worn position, and virtually eliminates marginal astigmatism and power error caused by variations in eye rotation, pantoscopic tilt and vertex distance. “Ws” designs are best suited for smaller “B” measurement frame styles. The original design technology, these 100% back surface designs offer a distortion free spherical front, wider fields of vision with optics closer to the eye and customized Rx’s for each patient. Seiko’s 1.67 Proceed III SUPER SHORT and Proceed II lenses are fully aspheric and asymmetric progressive addition lenses (PAL). They combine proven technology to minimize unwanted astigmatism, power error and distortion. Proceed lenses provide a generous wide-angle viewing area and superior optics, with a 12mm corridor in Proceed III SUPER SHORT, and 14mm corridor in Proceed II. Thinner and lighter with flatter base curves on both sides. Comparable to 1.74 index lenses. Back surface free-form compensation virtually eliminate power errors, distortion and marginal astigmatism. Improved optics over all other single vision lenses with the widest peripheral vision. Ideal for difficult Rx’s especially high cylinder. The worlds first double-sided aspheric design technology from SEIKO provides the highest optical performance in a lens that is lighter, thinner and more comfortable than conventional spherical and aspheric designs. Seiko finished and semifinished 1.67 Super SV lenses are the most technologically advanced single vision lenses available. They are based on Seiko’s dual-patented MX aspheric low-base design, and manufactured using high index MR-10 resin. MR-10 is less sensitive to heat and does not readily contract or expand—factors that can lead to warping and coating deterioration. The manufacturing process uses individually surfaced production molds utilizing Seiko’s digitally precise Free-From optical technology. 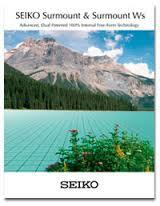 SEIKO PCWide lenses are a new generation of free-form occupational lenses designed for people who spend most of their work time in a desktop environment. Their 100% back-surface design offers several advantages over single vision and progressive lenses. They are an ideal choice for those who desire the most comfortable vision and highest level of optical quality, especially when spending long hours on a computer or when reading or working up close. They are available in a variety of materials and coatings to further enhance their appeal.